Created for cooks who love to create meals for friends and family, KitchenAid offers long lasting grills that anyone can use and enjoy. 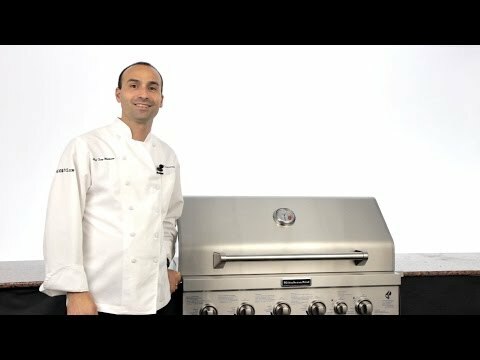 This KitchenAid propane gas built-in grill features four 304 stainless steel burners that produce 12,000 BTUs each and has 556 square inches of main cooking area on stainless steel wrapped cooking grates and 177 square inches of secondary cooking area for a total of 734 square inches. The 13,000 BTU ceramic rear infrared burner is great for roasting chicken for rotisserie style cooking. Starting the grill is simple with the easy-to-use continuous electronic ignition powered by two AA batteries. This grill features an Even-Heat System, which consists of stainless steel burners, angled flame tamers, and enhanced grates, which work together to distribute consistent heat across the entire grill surface and reduce flare-ups. This grill features a fully welded stainless steel, dual wall main lid with an oversized temperature gauge, and comes with a stationary tank tray. KitchenAid features dual energy valves on all of their grills and include natural gas orifices, making it possible to switch between natural gas and propane fuel types. Unit ships as propane ready with orifices for natural gas conversion included. Conversion must be done by a licensed professional. Cooking Grid Dimensions 29 1/2 X 19 1/2"
The stainless steel tube burners are warranted for ten (10) years, cooking grids and stainless steel parts for three (3) years and all other parts including searing and rotisserie burners for one (1) year. We recently ordered this Kitchen Aid grill, and grilled on it for the first time last weekend. 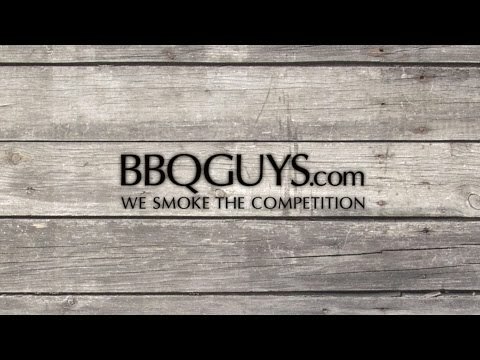 First of all, the service from BBQ Guys was great. Second, the grill definitely looks like a quality built-in, and the food we grilled was delicious. Looks great and works wonderfully. Rotisseried a 10# turkey on Thanksgiving, which turned out delicious. Thought it was a real bargain for the first couple years. Then the quality showed, as parts began failing. Must adapt generic replacement parts as needed, since product is no longer made or supported by KitchenAid. If you are buying this to use as a natural gas grill, be warned, the conversion from Propane is not super straightforward. You basically have to take the grill apart replacing orifices on every burner including the searing burner. Had I known this, I would have purchased a grill that shipped as natural gas. With that said, we haven't used the grill yet, so I can't comment on the performance, but it looks to be of nice quality. KitchenAid Gas Grills combines an attractive price point with some of the specs and features often found on premium-priced grills. It is made of almost all 304 stainless steel which is great. KitchenAid grills are made by NexGrill who licenses the KitchenAid name from the Whirlpool Corporation. The 30-inch grills have four 12,000 BTU burners and the 36-inch grills have four 10,000 BTU burners. The burners on both models are constructed of high-grade 304 stainless steel, which is a plus. Both built-in grill models include a rear rotisserie burner though the rotisserie kit is sold separately. The KitchenAid 36-inch Gas Grill includes an 18,000 BTU infrared searing burner for steakhouse quality searing, which is not typically found on grills in this price range. The Even-Heat System consists of the stainless steel burners, angled flame tamers as well as enhanced grates. These all work together, to distribute consistent heat across the entire surface of the grill. It also aids in reducing flare-ups. Another plus is the easy-to-use electronic ignition. The nicely designed, built-in hood thermometer is easy to read and helps you gauge the amount of heat inside the grill. The cooking grids are stainless wrapped steel, not solid stainless steel. Once the wrap wears off, the raw steel underneath can rust. The natural gas (NG) grills need to be converted using the included conversion kit. This should be done by a licensed plumber. This takes some time, and may create an added cost for more of your plumber's time. While it’s nice that the burners are warrantied for 10 years, the other stainless components are only warrantied for 3 years, and all other parts only 1 year. KitchenAid doesn't offer a full line of outdoor kitchen accessories, so you'll need some universal-style accessories to round out your outdoor kitchen. You want an affordable, entry level, built-in grill for your outdoor kitchen. Great question! This grill features four 304 stainless steel burners that produce 12,000 BTUs each, and it heats up quickly because of that. It also features a continuous electronic ignition, which means you can light your burners instantly. It offers plenty of space if you need to cook for several people at a time. 29 1/2 X 19 1/2" 27 X 18" 30 X 19" 28 X 17 3/4"
30 11/16" 29 3/4" 31" 30 3/4"
20 13/16" 21 3/8" 21" 20 5/8"
10 1/2" 7 1/2" 9 1/2" 8 7/8"